Norbert Hofer is a nasty piece of work. On the surface, he seems like a bland, soft-spoken, conventionally handsome Central European engineer-turned-politician who emphasizes the conventional conservative values of family and nation. But during the recent prolonged Austrian presidential election -- first round in May, second round last Sunday -- the candidate of the Freedom Party was in fact a walking, talking dog whistle. Behind the smiling façade, Hofer is a gun-toting, anti-immigrant, far-right-wing nationalist who once declared that “Islam has no place in Austria.” He dresses up his racism in the language of “identity” (beware white people who talk about identity -- they really mean supremacy). He likes to wear a blue cornflower in his lapel, which he points out, quite correctly, is the color of his Freedom Party. It also happens to be the flower that secret Nazis used to wear to signal their beliefs to confederates. No surprise that the first leader of the Freedom Party back in the 1950s was a former Nazi and member of the SS. Of course, this is not the Freedom Party of the Cold War era. Hofer has steered it in a pro-Israel, pro-Russia direction. After all, Benjamin Netanyahu and Vladimir Putin are the new one-two punch of a right-wing Judeo-Christian tradition that targets its third monotheistic cousin. In this way, Hofer is following the script of Donald Trump, who counts on the support of these two democratically elected autocrats in his multi-front assault on Muslims. 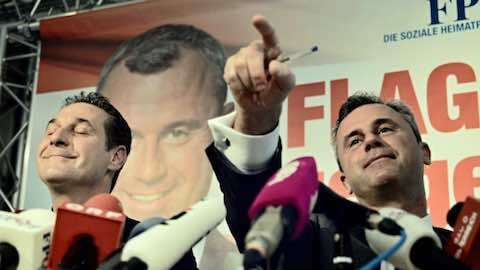 In the end, neither his soft-pedaled Nazism nor his hard-core illiberalism helped put Norbert Hofer over the top. He lost Sunday's election by more than 300,000 votes. As an also-ran, Hofer joins a long list of far-right-wing nut jobs who have come perilously close to leading European countries over the last few decades. Anti-Semite Jean Marie Le Pen forced a run-off in the French presidential election in 2002, but a concerted effort by everyone to the left of Genghis Khan produced a huge margin of victory for conservative Jacques Chirac. In the Balkans, far-right-wing candidate Corneliu Vadim Tudor of the Greater Romania Party came in second in Romania's 2000 presidential elections, while far-right candidate Volen Siderov of the Attack party came in second in Bulgaria's presidential elections in 2006. In Denmark, the People's Party grabbed the second spot in the 2015 parliamentary elections. Indeed, many Europeans dearly hope that the victory of Green Party leader Alexander Van der Bellen in Austria's presidential election proves that Donald Trump's influence does not extend beyond the territorial waters of the United States. Sure, Britons supported Brexit -- but that was by the slimmest of margins, and many of those “leave” voters had serious second thoughts the morning after. Up until recently the National Front's Marine Le Pen was leading polls for the upcoming French elections in March. But the entrance of archconservative Francois Fillon into the race makes a replay of 2002's trouncing of Le Pen the Elder much more likely. On the other hand, Italians went to the polls, also on Sunday, and rejected the referendum sponsored by current Prime Minister Matteo Renzi. Voters turned against the measure for many reasons, but they were certainly signaling their displeasure with the political elite, and its economic policies. The clear winner in Italy on Sunday: the populist party of Beppe Grillo. It's not just Italy heading in a populist, Euroskeptic direction. As I explained recently, populists anticipated the Trump era by taking over in Poland, Hungary, and Slovakia, incorporating into their agenda many of the demands of parties further to their right. In other words, Europe has dodged a few bullets, but it's practically a fusillade out there. So, what's it going to be, Europe? Are you going to follow the example of Austrian voters and establish yourself as a counterweight to Trump's America? Or are you going to follow the example of Italian voters and be swept away by the Trump tide? With so much of the world coalescing around some fusion of capitalism and authoritarianism -- in Russia, China, Turkey and Central Asia, most of the Middle East, much of Africa, and parts of the Far East and Latin America -- much depends on Europe. During the George W. Bush administration, “old Europe” looked with horror at U.S. actions in Iraq and elsewhere. Both France and Germany refused to go along with the invasion of Iraq and fiercely opposed other practices of the Bush team, like extraordinary rendition and torture. Not all of Europe was so oppositional. The UK, under the self-aggrandizing Tony Blair, eagerly auditioned for the part of Washington's lapdog. Poland, under the former Communists no less, hosted one of the CIA's “black prisons.” And great moral voices, like Vaclav Havel, also backed the Bush administration, under the mistaken impression that Washington was engaged in a battle on behalf of human rights and Western civilization. A similar division is emerging in Europe today. Germany and, at least for the time being, France are looking at Donald Trump and his foreign policy team with shock and bewilderment. Before the election, French President Francois Hollande said that Trump's “excesses make you want to retch” and indirectly recommended that American voters to support Hillary Clinton. Since the election, Hollande has focused on urging Trump not to scupper the Paris climate deal, something the president-elect promised to do during the election. But France may not serve as a counterweight to Trump for very long. Francois Fillon, the current presidential frontrunner, is only slightly closer to the center than Marine Le Pen. Like Norbert Hofer, he wants to wage a civilizational war against Islam, team up with Russia in this cause, reduce immigration, attack multiculturalism, and generally put France first. That leaves Angela Merkel and Germany. Merkel is perhaps an unlikely figure to stand up to the likes of Donald Trump. She is the leader of the conservative Christian Democratic party. She's no liberal, much less a progressive. She's never been comfortable with multiculturalism and recently backed a burqa ban. But she also welcomed a million refugees into Germany and has forcefully defended Ukraine against the predations of Russia. Moreover, she’s reinforced Germany's position as the anchor of the European Union, an institution that Trump dismisses out of hand. Trump is the trailblazer of a new authoritarian and chauvinist international movement. … They want a rollback to the bad old times in which women belonged by the stove or in bed, gays in jail, and unions at best at the side table. And he who doesn't keep his mouth shut gets publicly bashed. Migrants are deprived of all self-evident fundamental rights, such as the free choice of residence. The law provides them with jobs but pays them only eighty cents an hour. That's not even a tenth of the minimum wage. Second-class citizens are being created -- a poor prerequisite for integration. Don't write off the European left quite yet. Hollande is out of the presidential race in France, so perhaps someone else from the Socialist Party can pull off an upset. The Social Democrats were actually the first-place winners in Germany's local elections in September and they could conceivably cobble together a ruling coalition after the 2017 federal elections. Labor could take advantage of David Cameron's miscues in the UK and retake power in the next elections (which have to take place before May 2020). The left is in charge in Greece and Sweden. Donald Trump is a divisive figure for all the usual reasons -- his sexism, racism, xenophobia. But he also represents a larger, older project of division: the movement to unravel federal power, as I argue in a recent TomDispatch essay. In the United States, this anti-federalism can be found among those who don't want to pay taxes, maintain public schools, protect federal lands from ranchers, fund abortion clinics, sustain national health care, and so on. In Europe, this anti-federalism appears as Euroskepticism. The same animus directed toward Washington elites translates across the Atlantic into hostility toward the bureaucracy in Brussels. The Trump tide can be measured in the growing popularity of populist figures like Norbert Hofer, Marine Le Pen, and Frauke Petry, as well as the greater tendency of mainstream politicians like Francois Fillon to draw from the same cesspool of ideas. But the real test of the Trump tide will be the durability of the EU itself. Can the levees that visionary European leaders built over the course of decades keep out the polluted floodwaters? But the EU requires a certain leap of faith. When its members no longer believe in it -- no longer trust that it will remain an advantageous alliance of interests -- then its bonds begin to loosen. The first step in that process may well be the Brexit vote earlier this year. Or perhaps that will serve as a wake-up call, a reminder of how unusual and precious transnational cooperation can be -- whatever one might think of the EU's actual policies. According to recently polling in several major member states, support for the EU has edged upward since the Brexit vote. Donald Trump's presidential victory may well be an even stronger inoculation than the Brexit vote against the virus of right-wing populism and anti-federalist mania. Tides come in, often with tremendous destructive energy. But tides also go out. It's still not clear what direction the Trump tide is heading. Article: Courtesy Foreign Policy in Focus. Europe: "Can Europe Resist the Right Tide?"